As folks who follow this blog know, I’ve been engaged in a semi-successful effort to track down transcripts of Supreme Court oral arguments related to IP from before they started recording audio in OT 1955. One organization that I figured would have a couple of such transcripts, including from the foundational 1917 case of Herbert v. Shanley, was the American Society of Composers, Authors, and Publishers, or ASCAP. The invaluable Dean Kay, author of the Dean’s List email many of you already receive daily, brokered the connection with ASCAP’s Senior VP Richard Reimer, who informed me that ASCAP was moving offices shortly, and I should move fast. Upon arriving at ASCAP’s (former) offices, it was made clear to me that they wouldn’t have room for their library in their new offices, and it needed a new home. About half the books were already boxed up, and I boxed up about 10 more boxes, loaded everything into the car, and drove it down to the Jacob Burns Library at the George Washington University School of Law, where I’d arranged for the books to join the collection. The Law Library put up a nice piece about the collection here. At first glance, one volume of particular interest to the broader public is the one related to Nathan Burkan’s defense of Mae West on charges of obscenity related to her play The Pleasure Man. There’s a nice writeup of the story here, which I won’t repeat. 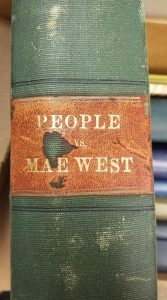 However, I have scanned the entire section of the book related to the Mae West and put it online (I didn’t scan the rest, dealing with People v. Joseph Flinn – there’s only so many hours in the day). It’s available here, and it includes legal arguments about cross-dressing not being obscene as well as a complete draft affidavit for Mae West’s signature detailing the entire history of the production. Below the jump I’ve included a list of the cases which have papers included in the ASCAP collection now at the GW Law Library. This list is not complete and is just meant to help those looking for information on a particular case. Paull-Pioneer Music Corp. v. Johns & Johns Printing Co. Plain Talk Magazine, Inc. v. Columbia Pictures Corp.
Russell & Stoll v. Oceanic Electrical Supply Co.
Sheldon & Barnes v. Moredall Realty Corp.
Smalley v. Columbia Pictures Corp.
Spitz v. Motion Pictures’ Greatest Year, Inc.
Cohan v. Robbins Music Corp.
Davies v. Columbia Pictures Corp.
Murphy & Gallagher v. Warner Bros. Inc.
MGM Corp. Educational Film Exchanges, Inc. v. Bijou Theatre Co.
G. Ricordi & Co. v. Columbia Graphaphone Co.
O’Neill v. General Film Co. US v. ASCAP / In re Shenandoah Valley Broadcasting, Inc.
Smith v. American Pharaceutical Inc.
Jacobsen Publishing Co. Inc. v. Columbia Pictures Corp.
Redmond v. Columbia Pictures Corp.
Wanger v. Paramount Public Corp. In re Burkan for a mandamus order against Ex-Lax Inc.
Torquay Corp. v. Chelsea Exchange Corp.
Bengue v. American Pharmaceutical Co.
Buck v. The Voice of Brooklyn, Inc.
Burkan v. Pan-American Petroleum & Transport Co.
Consolidated Film Industries, Inc. v. Weiss, Agfa Raw Film Corp.